A pathologist is a doctor who has specialised in the causes and diagnosis of disease. In Australasia, this involves at least five years of postgraduate training after qualifying as a doctor. “Many people think of pathologists as those rather eccentric individuals performing autopsies in television shows like Silent Witness,” Associate Professor Chris Hemmings from St John of God Pathology. In bowel cancer cases, by knowing what the normal bowel lining (mucosa) looks like, it is possible to see changes in structure that indicate that a polyp or a cancer has developed. “We can see various types of polyps, and some of these will not turn into cancer, but one common type of polyp called an adenoma is known to progress to cancer in some cases, if it is not removed,” A/Prof Hemmings says. Cancer is diagnosed when the growth has spread beyond the mucosa into the deeper layers of the bowel wall. In most cases, the patient will then require surgery to remove the affected portion of the bowel where the cancer developed. 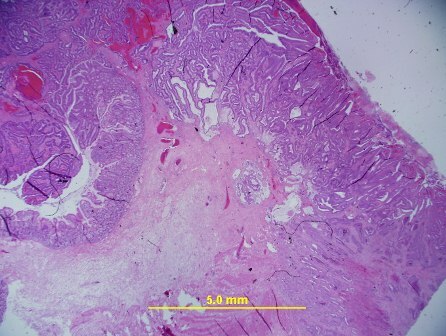 “The pathologist will then examine the segment of bowel to ascertain how far the cancer has spread, whether it has been completely removed, and whether there are additional risk factors (such as cancer growing into blood vessels) which mean it is more likely to come back,” A/Prof Hemmings says.